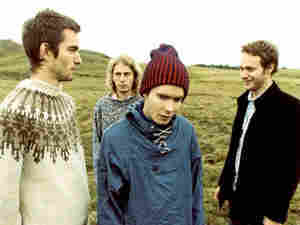 Sigur Ros: Gloom And Grandiose Pummeling For all its moments of impishness, Sigur Ros' new album remains terrific during those times when it reverts to portentous austerity and inscrutability. "Festival" is a wondrously majestic epic, as weird and sprawling and soaring as it is accessibly beautiful. This past June, the artily adventurous Icelandic band Sigur Ros released Med Sud I Eyrum Vid Spilum Endalaust, an album surprisingly well suited to the giddy thrills of summertime. The whimsically titled opening track, "Gobbledigook," heralded a work of uncharacteristic impishness, which was refreshing coming from a group known largely for portentous austerity and inscrutability. Of course, it's December now, and Med Sud I Eyrum Vid Spilum Endalaust has just been reissued in deluxe (read: more expensive) form. Which makes this an excellent time to revisit the disc and soak up just how terrific it remains during those times when it reverts to good old-fashioned portentous austerity and inscrutability. "Festival" may sport one of Sigur Ros' few English titles, but it's a wondrously majestic epic, as weird and sprawling and soaring as it is accessibly beautiful. Spanning nine-plus minutes, "Festival" treads familiar structural ground, building from falsetto-fueled gloom to an ominously rumbling swell, right into a lengthy round of grandiose pummeling that'd make Godspeed You Black Emperor proud. In context, it still fits nicely within an album praised for its concision and unexpected playfulness. But as a stone-serious stand-alone piece, it's a fierce and satisfying gem, as muscular as it is graceful. Listen to yesterday's Song of the Day, and subscribe to the Song of the Day newsletter.